Having participated in two successful winter tests in Qatar and Australia the Yamaha Motor Italia World Superbike Team is already in a high state of readiness to meet the challenge of the forthcoming World Superbike Championship season. Noriyuki Haga and Troy Corser (both Yamaha Motor Italia WSB Team) continue their riding partnership for a second year, after taking a total of 24 podiums between them last season. Japanese superstar Haga came within a meagre two points of winning the riders・championship outright on ・7, ending the campaign with six victories to his credit. In the Qatar test last November both Haga and Corser on the 2008-spec Yamaha YZF-R1 made immediate improvements even compared to the strong results obtained by the 2007-spec machines, and carried on their good work in the subsequent test last month, at Phillip Island. These venues are the first two on the WSB calendar, the 5.380km circuit of Losail again enjoying its now traditional status as the season opener, on Saturday 23rd February; one week ahead of the Australian round, on Sunday March 2. In the Qatar test Corser was particularly fast from the outset, with Haga matching him on the final day, while the changing conditions of the Phillip Island tests provided more of a challenge to both riders and technical staff. Everyone in the highly respected YMIT (Yamaha Motor Italia) WSB squad worked hard to make final adjustments to the 2008-spec Yamaha YZF-R1 and help the championship痴 single make tyre supplier with feedback on their latest development tyres. Yamaha Motor Italia痴 YZF-R1 Superbike, a new model in 2007, was the tool with which Haga and Corser helped earn Yamaha the Manufacturers・Championship, and the 2008 version has undergone a comprehensive programme of development over the winter months. 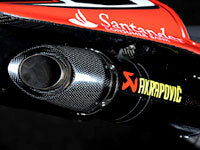 The race machine now runs Yamaha痴 revolutionary YCC-I variable intake system, as fitted to the original road bike. Even in early trials this unique Yamaha innovation showed its potential, and in testing has provided smoother and more torquey engine response in the midrange, reduces the massively powerful R1痴 desire to wheelie in the lower gears and yet still maintains its class-leading top end performance. Due to recent changes in the WSB technical rules four-cylinder machines can now run at a minimum weight of 162kg, and the R1 has lost mass due to a new swing arm design, lighter Akrapovic exhausts, a carbon airbox and even a new lightweight wiring loom to meet that new lower limit exactly. The latest rear swing arm is a step closer to the state of perfection that demands more feel with less unsprung weight; more ultimate performance with longer tyre life. The latest generation of ﾖhlins suspension units also make a significant contribution to the weight loss programme, and have already shown measurable improvements during the track tests. 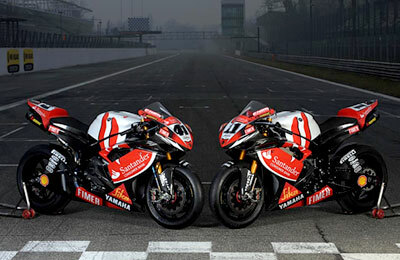 The look and graphics of the 2008 machines are based on the 2007 versions, while a new logo joins existing sponsors Santander, Sika, Akrapovic and Fabbri on the flanks of the R1. FIMER, a welding machine company that has long links to Yamaha Motor Italia (even taking over the premises once used by the Yamaha importer in its early years) has now signed a three-year deal to support the efforts of the official YMIT team in WSB. 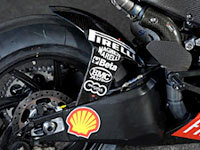 The 15-round 2008 season is set to be a stiff challenge for all comers, with four long haul races instead of two, Qatar, Australia, USA and Indonesia, and four individual venues which are either new to World Superbike entirely or have been missing from the calendar for a decade or so. Final pre-season preparations will be carried out in a two day test at Qatar on 12 and 13 February. The first round begins for real with first practice on Thursday 21 February, continues with Superpole qualifying on Friday 22 and culminates in race day, Saturday 23 of February. 展e had a very good test at Qatar and although we found some more work to do in Australia we were still satisfied with our progress on the bike. 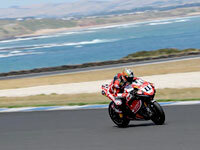 It was a big improvement in Qatar, and in Australia we went faster than we did last year - faster than we had ever gone. 徹verall, we expect to have some small advantage over the manufacturers who will arrive in 2008 with new machines, and we will see what the real potential of the new 1200cc twins are in races, not testing. The main thing is that we know our bike is already better than the way it finished the season with a double win in Magny Cours last year, thanks to many areas of development. One is reduced weight and we will start on the weight limit of 162kg. 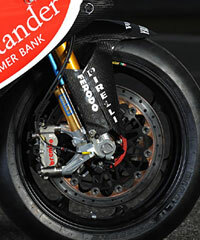 Another example is the new rear swing arm that has proven to give both the guys a more positive feeling on the track.